A dress that was previously mentioned about the pattern. I sewed the Vogue dress, 2900 in a very stiff fabric. I fell in love with this print instantly when I saw it for the first time on the dark corner of a small shop which was filled with many mysterious and miscellaneous goods and clutters from all over the world. I didn't know what to do with this African wax printed fabric, but I had to bring it home with me. I wore it on the last Saturday when I went to Tokyo to meet my friends, and I got quite a lot of compliments from them. I had a few unexpected compliments from strangers(!) while shopping on the day too. I think I have to be very thankful to Vogue Patterns! Dresses A, B have bodice with angled seams, yoke and side front pockets, invisible zipper closing. A: edgestitch finishing. B: ribbon trim finishing. A, B: flared skirt with narrow hem. I chose style B, but sewed without ribbon trim finishing. I used size8. According to the size chart I should have made size12, however, thanks to the previous reviews I was brave to cut in two sizes smaller, and it was absolutely successful. Considering that I tend to like narrower ease on most dresses, I think its size12 was too big to my measurements generally. Yes, I think very much so, if it was without some adjustments I did to this dress. Yes. I sewed it in my way though. I like installing invisible zippers in the earlier step than the last step that was suggested in the instructions. I like the bias cut of the big skirt as well as the sharp image of the bodice. I don't have particular dislikes in the style, however, I think I can say that I am not fond of having a zipper on the back of my dress. It's just a very personal preference and I placed it on the side of this dress, and it was no problem at all. Plain cotton, African wax printed. It was a very stiff fabric, that was one of the reasons I wanted to cut it in bias. I have put the invisible zipper on the left side, instead of putting it in the back. I cut Bodice Back(4), Back Neck Facing(10), Skirt Front(12), Skirt Back(17), Yoke Back(19) and Yoke Front B(20) "on fold". I also shortened the bodice an inch and took 1.5 inches from the waistline. The reason I shortened the bodice was not that it was too long to my torso, but that I liked to raise the waist slightly higher than it was originally supposed to be. Yes, I am already planning the next one! I love the dress! 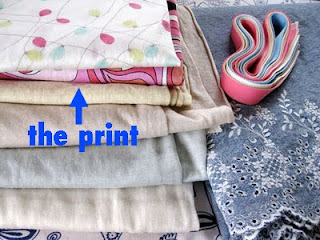 I got this African wax printed fabric, and it has grown in my mind that the fabric would make a pretty dress since then. Although it was a bit difficult and time-taking for me to match this print pattern on the bodice parts, especially in biased grain, the bias cut of the dress pattern helped a lot to get a nice fit from the stiff fabric, and I am very pleased with the result. I can recommend the pattern if you'd love a summery pretty sporty dress! I sewed an easy jersey dress from a tank top pattern. The pattern for this dress was actually my favorite tank top pattern. I extended the length and also added a pair of short ribbons at waist to make a knot on front (they don't go around the back). The ribbons were sewn in the side seams when the front and back parts were stitched together. 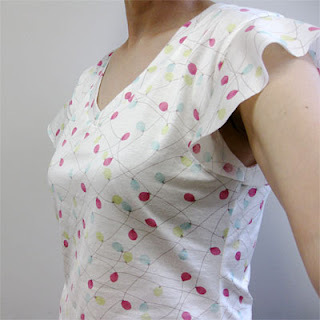 The pattern is "gathered (neck) tank top" from Aviver Paper Patterns which is a Japanese web pattern shop. It has got a set of twisted band of hem at neckline and armholes as you may see in my pictures, and I like the interesting feature. I am devoted to this pattern when talking about tank tops, because I know the results from the pattern always look feminine and pretty. I'm happy that it made a pretty dress too. The fabric is 2-way stretch soft cotton jersey with PU blend, which has an obvious characteristic print. Before you mention it, I'd love to explain that this print is indeed being licensed by the brand which you are likely to imagine. I am not familiar with brands and such businesses, but I've heard that some company got a deal with the brand's company for a license to use those kind of prints (I don't think these prints are exactly same as those ones which were used for the high fashion brand, they are just similar) on their own fabrics, and thus these fabrics are sold with the iconic prints legally in Japan. By the way, they have no name of Pucci on them at all. That's why I am wearing very home-sewn and rather casual jersey dress, which might remind most of the people one certain luxurious brand. Now I am a bit worried if it was legal to tell internationally..... I hope it is. I also made another Fujiko cardigan in the color that suits this dress. The fabric is a linen blended very soft silk jersey in soft peach pink. I'm really enjoying every single piece of my handmade cardigans, they must look indistinguishable to everybody else though. They fit me differently. They delight me differently too, that's for sure, but it was my happiest secret. Until now. I'm wishing you another happy day! I rarely put the direct links to certain web pages within my writing but I always have a link list of my favorite pattern shops in the right section. Please use it when you would like to visit them. The reason why I am this lazy includes the fact that I love to be a very bad and the least enthusiastic evangelist of any web shop. Yep, I am an enemy of web shops. My sewing machine is under service. My Bernina virtuosa153 has been away for nearly a week, because it was something wrong with electrical connection at the plug socket (of the machine). At first I thought there was a disconnection in the cable and it would be OK if I bought a new cable, but it was not the case. I didn't expect that I was going to leave my machine in the shop for fixing right then, at all, but I had no choice. Suddenly I had to become a machineless lady (if you have a such word). Although I was trying not to let them know my feeling, I think they sensed that I was greatly upset and sad. And they kindly offered this miserable woman a spare Bernina 130 that she could borrow as long as she wanted, for free. I thought it was very very kind of them. I thought I could sew as usual too. However, the funny part of the story is that the machine from the sewing machine shop is THE ONE that REALLY needs a maintenance. I can get a line of nice stitches with the machine occasionally, but most of the time, I need to unpick the whole stitches because they look odd and often skipped. The machine is not broken (I assume), but it seems abandoned too much for too long. I found so much dust and dirt, but no trace of oil in it. What I am doing right now with most of my spare time is cleaning this machine. Ha-ha-ha. They install a new plug in my machine and I clean their machine. I'm pretty amused by this stupid situation, though I don't think they have let me borrow the machine to make me clean it for saving me from boredom. I know they offered me this out of great kindness. So, I am compensating my feeling by jersey sewing using my other machine, a BabyLock serger, when I get bored with cleaning the sewing machine shop's Bernina. I still need to do some straight stitches on jersey occasionally and I am using this funny cleaning-unfinished one with a big struggle every time, and it makes me laugh loudly. It is almost amusing how a proper nice sewing machine from a reliable sewing machine shop is this low.... maintained. I hope they will clean it in a professional way and find a new owner who loves sewing. I need my beloved machine back ASAP too. My husband must be thinking that I went insane lately because of my weird sudden laughing into the outer space. What I got here is a T shirt. It has a lovely pair of ruffles on the shoulders. The fabric is a soft and thin jersey from Liberty. The pattern is 7Frair from anneeduex* and a PDF download (I've changed the shape of the ruffles slightly). I think 7Frair is a brilliant top pattern which has a very right fit with a hint of elegance. I have nothing spectacular to tell you today. Terribly sorry, everybody. I hope all of you and your equipments are doing well and healthy!